Make: Razer. 512GB solid-state drive (PCI-e). Manufacturer : Razer USA Ltd. Processor Type : Core i7. Product Type : Gaming Notebook. Product Family : Blade. Processor Core : Hexa-core (6 Core). Product Line : Blade. Processor: Intel Core i7 8th Gen.
Hard Drive: 250 GB SSD. MODEL: Blade Stealth. OTHER: Touchscreen. No AC adapter included. Lid has 1 dent as pictured. Unit has minor scratches as pictured. Chipped paint as pictured. Unit has wear marks from previous use as pictured. This authentically detailed replica is a reproduction of the actual filming prop. It is presented with a wood wall display (mounting hardware and instructions included) featuring a graphic motif of the Witch-king crown, and includes a certificate of authenticity. Manufacturer: Razer. Capacity: 128GB SSD 1TB HDD. RAM: 16GB DDR4. Includes Laptop, Power Cord, Power Adapter, Cleaning Cloth, Sheet Of Stickers & The Instructions. Provide our staff with Salt Lake City, Utah 84116. Razer Blade 15 with Power Adapter. Great manufacturer refurbished condition. Razer Blade 14 870m (2014). In good condition, has been sitting rarely used. Battery still lasts a few hours. Gtx 870m, touch screen, i7. Everything runs well. You get what is in the picture, the razer blade 14 (2014) laptop and the charger. USED in GOOD CONDITION-Clean Functional Laptop. Condition is Used. Has Windows 10 pro installed which will be wiped when sold to be a fresh version of Win 10 pro. Razer Blade - 15.6" - Core i7 8750H - 16 GB RAM - 512 GB SSD. We’ve redesigned the laptop to be more compact yet contain even more power and features. Razer Blade 15.6" Black. Verizon / Page Plus / Straight Talk No Service. Trending at $1,999.99eBay determines this price through a machine learned model of the product's sale prices within the last 90 days. The NVIDIA GeForce GTX 1060 graphic card has issues and does NOT function (problem code 43). The on-board graphics does function so it does function as a laptop but would NOT be good for gaming. This item is in "Used Condition" - Item shows signs of previous use. Graphics Card: GTX 1060. Display: 4K @ 60 hz touch screen. Razer Blade RZ09-01301E21-R3U1 14-Inch 256GB, Intel Core i7 4th Gen,2.6GHz, 16GB. Condition is Used. Shipped with USPS First Class Package. Comes with original packaging and power adapter. Still performs like new with one exception - the battery doesn’t feel like it lasts quite as long as it did when new. It’s in great physical condition. Windows 10 64-bit. Nvidia GeForce GTX 970M discrete graphics card (GPU) (3GB GDDR5 VRAM). Intel i7 4th-generation quad-core processors, 2.6GHz base speed, 3.6GHz turbo speed. 14.0” IPS Full HD 16:9 Ratio 1920x1080 resolution. 8GB DDR3L RAM. Weighs 4.19 lbs. Ending Saturday at 6:23PM PDT2d 22hType: Notebook/LaptopModel: Razer BladeProcessor: Intel Core i7 4th Gen.
Used Razer Blade 2014. Screen has crack on it but still displays normally. Touchscreen no longer works. 6 month old battery. Minor scratches. See photos or contact me. Razer Blade 14. Never overclocked GPU or CPU and only used for a total of maybe about 30 - 40 hours for gaming. (Easily Removable). Razer Blade Signature Edition 14" i7 4720HQ 16GB, 256GB SSD GTX 970M. System has been fully updated, cleaned, and restored to factory settings. The case has a couple minor scratches and 1 little ding on the lid(see pictures). The screen is perfect with no issues and the laptop runs excellent. Comes with the laptop, and charger(No Box). Adult owned and used for mild gaming. Im selling due to wanting a Surface Book 2. This is a very nice unit please feel free to ask any questions. Check my feedback ! REASONABLE offers will be considered. Shipped insured with signature required. No buyers with under 5 feedback and wonky addresses. This laptop will be shipped with tracking and signature required. Condition is Used. Amazing condition. Overall condition is 9/10. Slight wear marks. I bought this laptop in Nov. 2017 and no longer need it. My loss is your gain. USA ONLY! Its in mint condition and lightly used. I have too many laying around the house and like to help out who ever buys my laptop. NVIDIA GeForce GTX 1060. 16 gigabytes. Sorry, No Exceptions. Model Number. Color Category. Black CNC Aluminum. Casing Material. EPEAT Qualified. 250GB SSD, 16GB Ram. Touchscreen, Green Backlit Keyboard. Windows 10 Pro Installed. I5-3320M processor, 8GB RAM (if you only buy one then 4GB), 256GB SSD, three functional USB. 13.3", Widescreen; LED backlight bright LCD with wide viewing angles, HD , 1600 x 900, Dual Digitizer (pen input and capacitive multi-touch screen). Keyboard with Razer Chroma™ single-zone full key backlighting and anti-ghosting technology. 256GB PCIe M.2. Anodized Quartz Pink finish, tone on tone Razer logo. Dolby® Atmos support. Array microphone. The blades are made of tempered 420 J2 stainless steel, with sharp edges. Deep etched with a gold-tone color. Full length tang construction. Hardware and instructions included. UC1372 Fighting Knives of Legolas™. Rely on robust, high-performance storage with the 512GB solid-state drive of this Razer Blade gaming laptop. Make: Razer. RAM: 16 gigabytes. 14" Full HD display. Q: Are Your Prices Negotiable?. Display Type: Full HD Widescreen LED. 512GB PCIe M.2. Keyboard with Razer Chroma™ single-zone full key backlighting and anti-ghosting technology. Temper 6 CNC precision milled unibody aluminum chassis, Anodized black finish, tone on tone Razer logo. Brand: RazerProcessor: Intel Core i7 8th Gen. Rely on robust, high-performance storage with the 512GB solid-state drive of this Razer Blade gaming laptop. Learn more about refurbished products. Refurbished Razer Blade. NVIDIA GeForce GTX 1060 graphics. Limited Quantity Razer Quartz Pink Blade Stealth 13 Laptop. Keyboard with Razer Chroma™ single-zone full key backlighting and anti-ghosting technology. 256GB PCIe M.2. Anodized Quartz Pink finish. Height: 0.58” / 14.8 mm. This is in mint like new condition. Beautiful laptop and does great gaming. I had this for over a month only but barely used. I didn't travel with it so it made more sense to have a desktop. Again it's mint condition. Processor: Intel Core i7 6th Gen.
OtherModel number: RZ09-02386E92-MSU1 • 144Hz refresh rate • Anti-ghosting Razer Chroma backlit keyboard. This warranty covers the unit for any manufacturer defects. Warranty & Support. WE ARE NOT ABLE TO STOP AN ORDER ONCE IT'S PLACED! NVIDIA® GeForce RTX™ 2070 Max-Q Design (8GB GDDR6 VRAM, Optimus™ Technology). RTX 2070 Full HD model: 4.63 lbs / 2.10 kg. Kensington™ Security Slot. 7.1 Codec support (via HDMI). Dolby® Atmos support. With the Razer Blade’s thin and light design, you’d never guess it holds all that power. Razer RZ09-01952E72. About Razer. It's a mission. It's exactly what drives Razer to create products which constantly tilt the competition in your favor. Anti-ghosting keyboard with Razer Chroma back lighting. NVIDIA® GeForce RTX™ 2060 Max-Q Design (6GB GDDR6 VRAM, Optimus™ Technology). Precision glass touch pad. Windows 10 (64bit). Built in Stereo speakers. 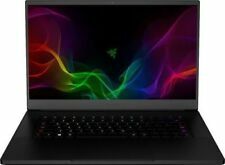 Ending Apr 30 at 1:21PM PDT5d 17hType: Notebook/LaptopModel: Razer BladeProcessor: Intel Core i7 8th Gen. Processor: Intel Core i7 7th Gen.
NVIDIA Geforce GTX 970M. NVIDIA GeForce GTX 970M. Razer RZ09-01652E22-MSU1. 512 GB SSD. Condition: Open box item in original box. In Grade "A" condition. No scratches on screen. May show little to no imperfections on outer casing. Razer Blade 14" Laptop, i7-7700HQ, 16GB RAM, 512GB SSD, Great gaming computer! Razer Blade 14" (Intel Core i7 7th Gen. 1060 6GB, 16GB RAM, 1 TB SSD) OEM Box!